"Long time no see. How are you?" Manuel asked. I responded to my friend, a 73-year-old street vendor, by saying, "I have been having my challenges. My knees have been bothering me a bit." As he removed a container of lotion from his market booth, Manuel said, "This will take away your pain." "How much is it?" I asked as I took out my wallet. Manuel answered insistently, "Oh, absolutely nothing, it's a gift." When I visited Manuel another day he offered me another lotion. It does work, too. Down the street I came upon another of my friends, Govianno, a tamarindo juice vendor. It was, as usual, close to 100 degrees so I said, "I'll have to have a cup of ice cold tamarindo. How much is it?" He shook his finger to say no, and said, "I am so glad to see you; it's on me." He then refilled my cup as we shared how our families were doing. Another day I visited Alfonso, who sells reading glasses, and bought a pair. His helper said it was 12 pesos, but then Alfonso insisted it be 8 pesos. He told me he hoped to visit his daughters in Bogota and that takes a lot of money. The generosity of these friends who are relatively poor compared to me was quite moving as I reflected on our exchanges. Here the poor are teaching me by example how to be generous. Sunday after church, friends Eberthys and Roberto invited me home for a meal. It was a good time catching up with each other. Then somehow I got to sharing about my excitement about the book, "The Myth of a Christian Nation" by Greg Boyd. I said, "Boyd has helped me see more clearly than ever that as followers of Jesus we need to watch very carefully that we do not align ourselves with any political party. We must be suspicious of all parties and yet support any efforts for peace, justice, mercy, and truth no matter what party." My hosts then shared, "What is known as the 'Charismatic Church' in Bogota has grown by leaps and bounds. Recently the Colombian President Uribe and his family attended 'Charismatic Church' meetings as a way of drawing more people to that church. The church, as a result, is giving a lot political support to Uribe. Here in Barranca many evangelicals are also aligned with political parties because of favors they receive from them." "I would really be interested in reading that book," Roberto said. I gave them a copy of the book. Eberthys is an English teacher and will translate for Roberto. They also shared about the recently elected Mayor Contreras, who is a Pentecostal, and stated, "Usually any time a new mayor is elected, he is expected to give some special favors to each of the Council members to get their cooperation. But Contreras publicly announced he was not going to do that and that money would be spent according to people's needs instead of according to political favors." Another aspect is that Contreras is relatively poor and he was running against a wealthy politician who owns the TV station. Everyone thought Contreras did not have much of a chance against such wealth and power, but Contreras won by just several hundred votes. Things don't have to continue the same as they have always. These experiences confirm the principles that Lynne Twist points to in her book The Soul of Money. One truth is that the rich and poor both really need to help each other in the journey to find fulfillment. Another is that it is a lie that the rich and the powerful always win. Please pray for wisdom and courage for Mayor Contreras. Please also pray that I would be humble enough to admit my mistakes and to forgive others for any hurts I have felt as I work with the Team on my differences with them. I am thankful for my Colombian friendships and the generosity they are teaching me. 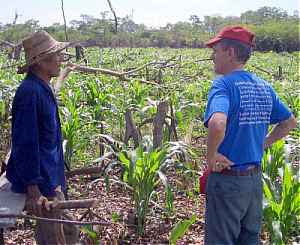 Here I am with a 73-year-old friend in the Opon looking over his 5 acre corn field, which he cleared with a machete and an ax. Notice the leftover stumps. He plans to turn the field into pasture for cattle. It had just rained and the corn was looking good.